Consider the various definitions of the internet of things, and then compare them to definitions of machine-to-machine solutions. There are substantial similarities between the two, and yet subtle differences have characterized the attributes of each. Figure 1 illustrates some of the differences. 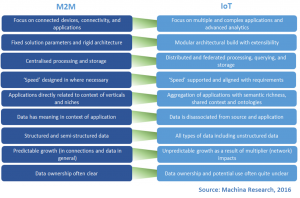 In reality the evolution is not quite as well defined as this would suggest; to a great extent terminology is less important than the idea that one environment, which can be defined as M2M, has given way to another which can be termed IoT. But perhaps the time has come to redefine the internet of things. In a recent survey of U.S. enterprises by Machina Research, over 81% of companies had either implemented or would deploy IoT technology in the next two years.1 This clearly indicates a growing awareness of the benefits and opportunities in IoT, and what is very interesting is that 69% of these enterprises plan to develop the means to capture and use product-generated data, including 80% of manufacturers. This focus on data, and ultimately analytics as applied to the data, has become the real story in the internet of things. As enterprises explore new insights, opportunities and value from this emerging technology, data and analytics have become invaluable functions in IoT. Technology vendors and analytics providers are busy developing and enhancing their capabilities in data management and analytics, particularly artificial intelligence and machine learning to meet these needs. And data and analytics has remained far from static — a key development has, as an example, been the combination of analytical tools with domain expertise, pushing analytics to new levels in such diverse areas as predictive maintenance for oil and gas pumps.2 At this time, IoT has become more about data-centric solutions than perhaps the more traditional product-centric view of M2M and IoT. But what is a product-centric view? In a product-centric view, infrastructures and architectures are defined and described in terms of the connected products or components. The focus in M2M and IoT are the products which include devices, networks, applications, platforms and solutions. Together they deliver product systems and, to date, enterprises and their IoT initiatives have focused on ensuring efficient and interoperable enablement technology layers to deliver such systems. In a data-centric view, the focus shifts from the building blocks of infrastructures and architectures, and turns to the actual content or data of the system, and particularly, how value is generated from the applications through analytics. A data-centric view begins to look at a totally different set of building blocks; data ingestion, data storage, data processing and aggregation, visualization and data analysis tools. In addition, a data-centric view raises and addresses issues such as data governance, security and ownership significantly earlier in the design process. There is an argument that the two are closely related, and that the product-centric and data-centric views are sides of the same coin. This is true, but ultimately the two are different and produce inherently different approaches and priorities. More importantly, it has become clearer what limits a product-centric view has, and how a data-centric view will help address these shortcomings. Why has the time come to redefine the internet of things? 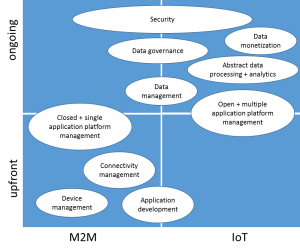 The product-centric view of M2M and IoT plays an important role in defining and raising the key infrastructure and architecture questions when implementing IoT upfront, but once these solutions are up and running, the next set of important questions emerge to which a product-centric view of IoT has been ill-prepared and ill-equipped to answer. These questions relate to questions of data governance, security and ownership. It is the ongoing attribute of IoT which enterprises and technology vendors are attempting to cope with, and one way to begin to answer all these questions is to start with a proper definition of IoT, namely being a focus on data and analytics and, more importantly, the building blocks that belong to the data-centric view. The definitions of M2M and IoT are part of a continuum or wider landscape of upfront and ongoing activities as illustrated in Figure 2. As noted, as the initial M2M implementation has taken place, i.e., that of the infrastructure and architecture, IoT becomes an ongoing enterprise task of data management and value creation through analytics and data monetization. A premature farewell to product-centric M2M?